Florida always seems to be in the news for one reason or another. If it's not alligators swimming in backyard pools it's invasive frogs that are a nuisance to everyone around. It seems the further south you go the higher the probability that you are going to run into some very strange things. For those that live in the Sunshine State know that this is in fact true. While normally Miami is known for its sprawling beaches, active nightlife and numerous celebrity sightings there is yet another reason our eyes are now set towards this city, and it's not one that is very pleasing. Pythons! Yes, pythons. They have slithered their way in and have multiplied at alarming rates. Pythons are the pet of choice for some people yet for many there are some things that are just better in theory. Once purchased there are some that grow tired of them and have no other recourse but to dispose of them. Rather than going through the proper channels Miami residents have been taking them down to the Everglades and releasing them back into the wild. 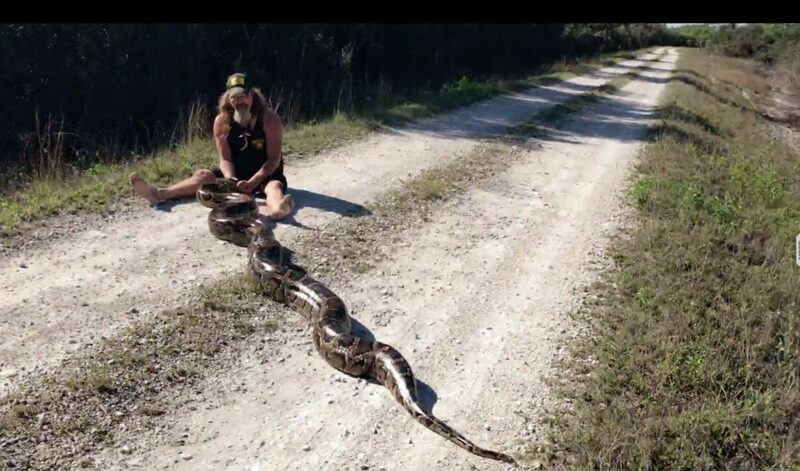 This brings us to our current problem, an invasive python issue in south Florida. So let's take a look at how bad the problem is and what these hunters are doing about it, on the next page. That’s a lot of boots! They really aren’t hurting anything. Florida. One reason why we aren’t wintering in Florida. How much per skin? Per Pound? That’s a friend of mine dustin crum. He’s been making pistol grips, belt buckles, belts and wallets. He has his own public facebook page. There’s gonna be a heck of a lot more out there after IRMA goes through. that thing is fatter than me!!! 500 should be less than a full hatch for 2 snakes right?